It’s hard to envisage what your life might be like when you move to a new town or buy a new home. It’s one of those things that you just need to experience and hope for the best. Well, it was. We’ve decided to put a little article together to show you exactly what your life could be like if you moved to Altair. Aaand stretch. You wake up in your luxury town-centre Altrincham apartment and you’re feeling ready for the day ahead. First thing’s first, you need a coffee and some fresh air. Thankfully, your only option isn’t just to open a window. At Altair, you can either enjoy our rooftop garden or relax in your very own private balcony. Today, you’re going to visit the garden. You pour yourself a brew and wander upstairs to the roof terrace so you can drink in the wonderful views of Altrincham, as well as your coffee. Maybe you even do a spot of yoga – you’re feeling pretty inspired up here. 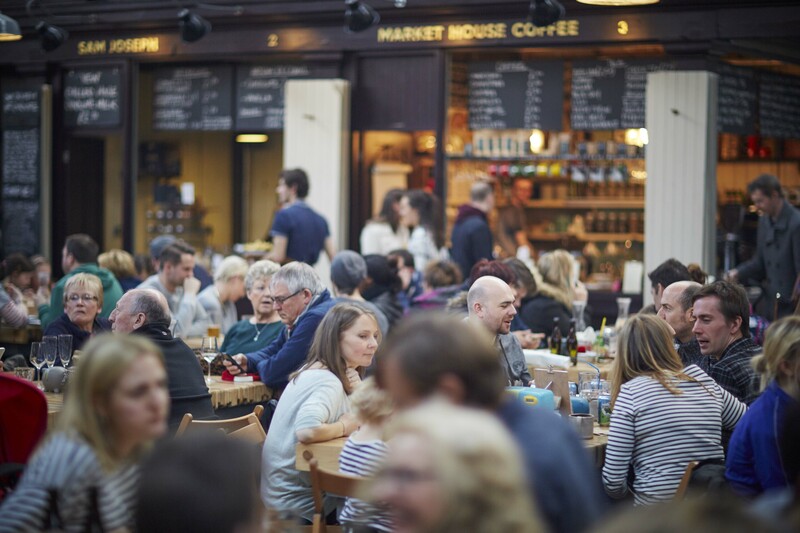 It’s Saturday – the perfect day to pop on down to the famous Altrincham Market. Saying that, the market is on every day apart from Monday and Wednesday, so you’re almost spoilt for choice! 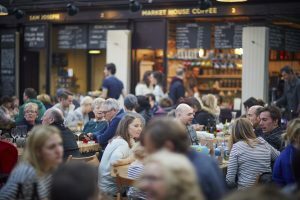 Altrincham Market has been a staple tradition in our town for countless years and has attracted attention far and wide due to its eclectic offering and steeped Northern tradition. Saturday serves up all of your traditional favourites from fresh fish to fruit & veg, regional cheese to prime meat cuts and jewellers to beautiful antiques. Good luck making it through the market without spending a few quid! All that shopping has worked up a bit of an appetite! After a quick stop off at your Altair apartment to get changed, and maybe a pre-dinner drink on the rooftop garden, you’re ready to eat. Yara – This Lebanese-style restaurant will not only give you a touch of the West with its stunning cuisine, but it’s also got a Bring Your Own Booze (BYOB) rule – so grab a bottle of wine from your Altair apartment and get ready for a great night! Coco’s – If anyone knows how to do good, hearty food, it’s the Italians. Coco’s serves traditional Italian dishes which you can enjoy in their relaxed, charming environment – and if you want to make the night particularly special, you can book their VIP section! Urban Burger Bar – Sometimes you just want something that’s totally moreish and will fill you up for days. Enter, Urban Burger Bar. This USA diner will fulfil all of your American food fantasies with its sky-high burgers and perfectly seasoned accompaniments. You might need to loosen your belt a little. You may be a little bit full but you’re just having too good a night for it to end already. It’s a good job that Altrincham is packed with popular bars and amazing live music. From the Old Market Tavern to the 5* rated Green Room, you’re going to be a little spoilt for choice on this front. If you fancy getting your dancing shoes on, check out our recent blog about the best live music venues to visit in Altrincham. And back to Altair to unwind. Maybe you want to make one last little trip to your private balcony to take in the stunning night-time views? We wouldn’t blame you. It’s funny how much you can actually fit into a single day – especially when you have such a range of activities to get up to in Altrincham. Oh, and this is just one option for a day of fun. If you want to know what else you could be getting up to as an Altair resident, stay tuned for our new blogs! A day in the life of an Altair resident – it doesn’t sound too bad, does it? If you would like to enquire about an Altair apartment, get in touch with Gascoigne Halman on 0161 929 1500, and don’t forget to follow us on Twitter, Facebook and Instagram to stay updated with our brand new development!